Let's be honest, the only thing more attractive than men in kilts are men in lederhosen (give me a Ja! my German-loving ladies! 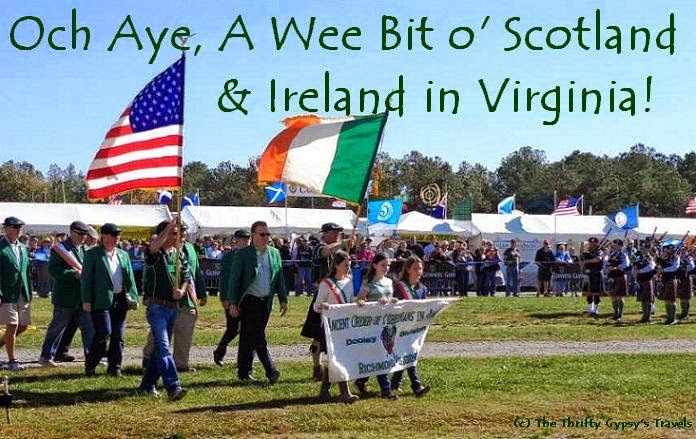 ), but the Central Virginia Celtic Festival & Highland Games came very close to changing my mind on that particular subject! Although the Celtic Festival has occurred in the metro-Richmond area for several years now, last weekend was my first experience - but it certainly won't be the last. Taking advantage of a LivingSocial deal for half-priced tickets, we spent an unusually warm September day sipping Guinness, watching large men throw things, and attempting to connect with the Scotch-Irish parts of our heritage. With Scottish, Irish, Welsh, and even Union Jack flags sprouting out of nearly every tent and a few legit brogues from various attendees and participants, it wasn't too difficult for my imagination to transport me to the highlands of Scotland or the rolling hills of Ireland. Well, minus the fact that we were enjoying a decidedly warm Virginia autumn day! We arrived in time to watch the Parade of Clans enter Guinness Field to the sound of bagpipes and the hurrahs of enthusiastic watchers. 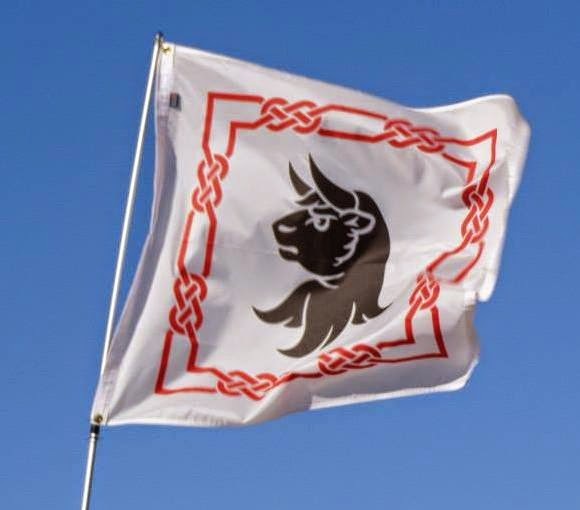 It was a rather informal parade, but you could sense the pride in every clan as they entered the field, hoisting high their clan's banners and flags. From kilts to suits to plaid-bedecked terriers, each clan paraded their unique heritage. 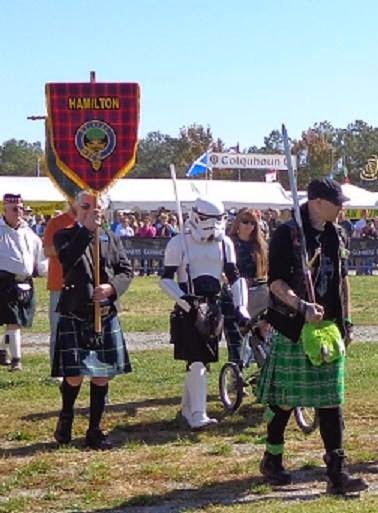 The crowd roared appreciatively at the kilt-wearing Storm Trooper from Clan Hamilton! After the parade, we wandered over to the Ancient Order of Hibernians' tent to trace the roots of our surnames to various localities in Ireland. Danny's family possibly hails from County Clare, located in the mid-southwestern portion of Ireland, and according to the septuagenarian we spoke with, "the prettiest county in all of Ireland." Coming from a gentleman who's traveled the better part of the world, we considered it high praise (and mentally added that particular locale to our bucket list!). We chipped in a tenner towards a raffle prize trip to Ireland and now have all our fingers and toes crossed until the drawing on St Paddy's Day. Maybe the luck of the Irish will finally shine on me?! 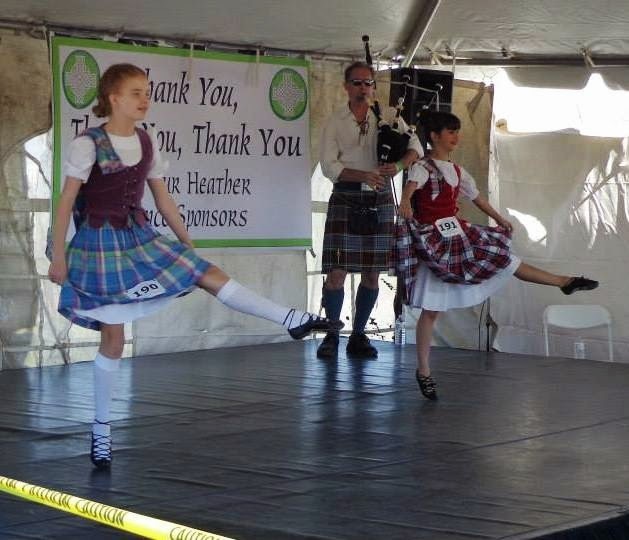 The sound of applause drew us to a nearby tent and stage for the Highland Dancing competition. Girls of various ages and abilities were dancing on the balls of their feet to the accompaniment of a bag-piper. The strength, skill, and stamina required for such dancing is remarkable; while many wouldn't consider dancing a sport, Highland Dancing is recognized as a sport by the Sport Council of Scotland. The highlight of the day, however, was observing the various Highland Games. We arrived in time to watch the ladies competing in the sheaf toss (or "sheep" toss as I first thought they said!). The rules are simple: use your pitchfork to toss a 7kg (16lb) burlap bag of straw above your head and over a horizontal bar. Competitors have three chances to clear the height cleanly as the bar is raised ever higher, ultimately eliminating all but one. It's amazing how fascinating it can be to watch men and women throw a burlap sack through the air! The hammer throws and weight toss were equally as amusing, but the big draw for the Highland Games is the caber toss. You know, the "large men throwing things" part of any Celtic festival! 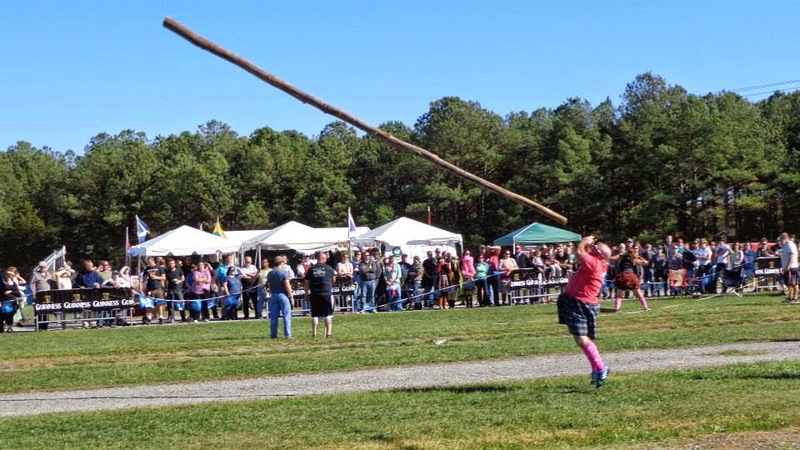 The word caber derives from the Gaelic word "cabar," which means a wooden beam. Traditionally, a caber is 19.5 feet long piece of Larch wood. While I can't vouch that the competitors were using Larch wood, I would say that it was approximately the correct length. Like the other games, the caber toss is straightforward. Fellow competitors or helpers hoist the caber to an upright position in front of the competitor and then step away, leaving him to manage it solo. The competitor must then pick up the caber and attempt to flip it end-over-end, preferably landing it at the twelve o'clock position. If none of the competitors are able to flip it over, then whoever's caber achieves the highest angle in air and lands closest to the twelve o'clock position will be deemed the winner. It looks simple, but you try throwing a log like that! All those games are sure to work up an appetite (being a spectator is serious business! ), so belly up to the food carts for some haggis, fish and chips, shepherds pie, and other Celtic-inspired eats. And as mentioned before, be sure to wash it down with a pint of Guinness to complete the experience. Sated, entertained, and sunburned, we spent a few minutes browsing the wares (wish I'd come across the t-shirt emblazoned with "I Can't Keep Calm I'm Scottish" that a friend's husband sported at the festival!) before heading home. As one friend put it, the Central Virginia Celtic Festival is no Renaissance Fair -- but the warmth and enthusiasm of the vendors, participants, and spectators will bring you back year-after-year like a family reunion that's open not only to those with a common heritage, but anyone who nods their head and taps those toes when the bagpipes start playing. Have you visited Ireland or Scotland? Have you attended a Celtic Festival? I have always been fascinated by Scottish clothing :) Have a wonderful weekend! We almost left Edinburgh without hearing/seeing bagpipes.. but then we did! Never been to a Celtic festival though. That's awesome! I'd love to visit Edinburgh! That looks like a really fun event! I have no Irish or Scottish blood whatsoever, but I love Irish music and Irish dancing and I hope maybe some time I'll visit this festival. Cultural festivals are always fun, even if you have no direct relation to it!